What’s the title again, I am sorry. Solid putting stroke left from the left wrist. Okay. It’s really important if you going to be a good putter to make sure that you maintain a solid wrist through the stroke and that the wrist don’t become flicky. So when we are talking about solid we don’t mean that you need to be tend so you need to hold the putter tight, all we’re talking about is that you are not using your wrist and your wrist is quite passive and it’s just staying at the same angle that it starts at so if we look at the putting stroke, to have a solid wrist, if we just look at the left wrist here, we see that as you swing there is no movement in the wrist at all, the wrist angle just stays exactly the same, there’s no movement in the wrist, they’re very quiet. Rather than seeing this kind of movement where you’re becoming very wristy, very flicky, and that’s going to make it very difficult for you to control the distance that you hit the ball consistently and also it’s going to be very difficult to control the accuracy that you hit the putt with because again it’s going to affect the club face as you flick your wrist. So to create a better left wrist position, what we’d want to do is set your feet, shoulder with the par, have the ball at the centre of the stand and make sure your eyes are over the ball or just on the inside. 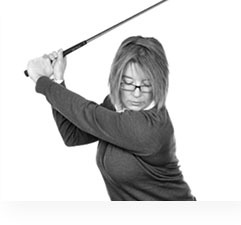 Let the arms tangle so they’re nice and loose from the shoulders and then hold the putter in that position. Now that creates a Y-shape with your arms and the putter and we just want to maintain that Y-shape so that as you swing back the Y-shape stays intact and then as you swing through, the Y-shape remains intact again so there’s no movement of the wrist itself and if you just maintain that Y-shape and swing from the shoulders the wrist nice and solid very passive and you’ll get a really repetitive consistent stroke so a really good drill to work on as you’re doing that would be, hold lower down on the handle than you usually would so you’ve got a good three to four inches of the handle sticking out at the top of your hands. Place another golf ball between your arm and the putter handle and then just work on making your stroke so that you don’t drop the ball from between your arm and the handle and that will really get you swinging from the shoulders and not using your wrist. If you tend to use your wrist and you’re not solid with your left wrist you’ll find that you drop the ball and it gives you that instant feedback so that you know that you’ve used your wrist and the wrist didn’t remain solid through the stroke so the next time you’re out on the putting green, have a go about little drill. Hit puts with that ball in, keep the wrist nice and solid and you should sign you’ve got a very repeatable and consistent putting stroke. I think that’ll really lower your shots when you’re out in the course because you’ll be holding a lot more putts.